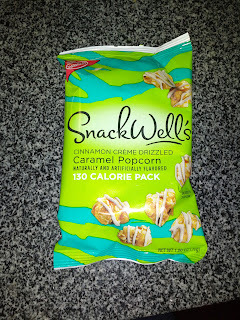 You may have noticed that I've been on a bit of a snack food kick lately. Chips, pretzels, snack bars, popcorns, etc. All that "junk food" that I haven't had in years, has suddenly been super appealing to me. I don't really know why. 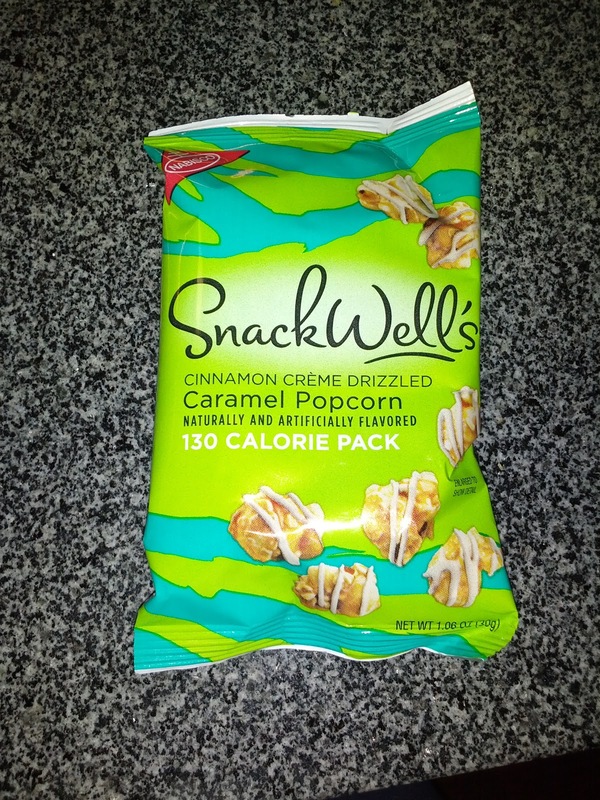 But anyway, in an attempt to be somewhat healthier in my crazy snack food consumption, I recently checked out a bunch of SnackWell's products. They all come pre-portioned, so you aren't as likely to devour a giant bag of them. Except ... I didn't find any of the packs to be large enough, and just started opening multiple bags at a time and pouring them into a big jar. If you are someone who has some restraint and can eat just a tiny package of these, then I can imagine the portioning to be a feature. 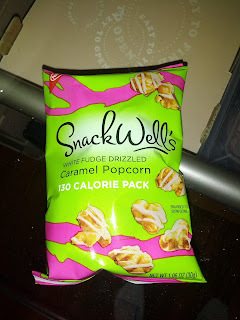 I tried several of the most dessert-like items: the drizzled caramel popcorns and the coated pretzels. They were pretty decent! Cinnamon Creme Drizzled Caramel Popcorn. Wow, this really impressed me! The popcorn was crunchy, not soggy like so many packaged popcorns. The caramel popcorn itself was sweet and tasty, but the cinnamon creme drizzle pushed it over the top. So much flavor. It was exactly as advertised, strong cinnamon flavor and creamy. It paired amazingly with a glass of eggnog. Would try again! White Fudge Drizzled Caramel Popcorn. After the success of the cinnamon creme drizzled caramel popcorn, I tried another variety, the white fudge drizzled. The caramel corn was the same, but the white fudge was far less flavorful than the cinnamon creme. 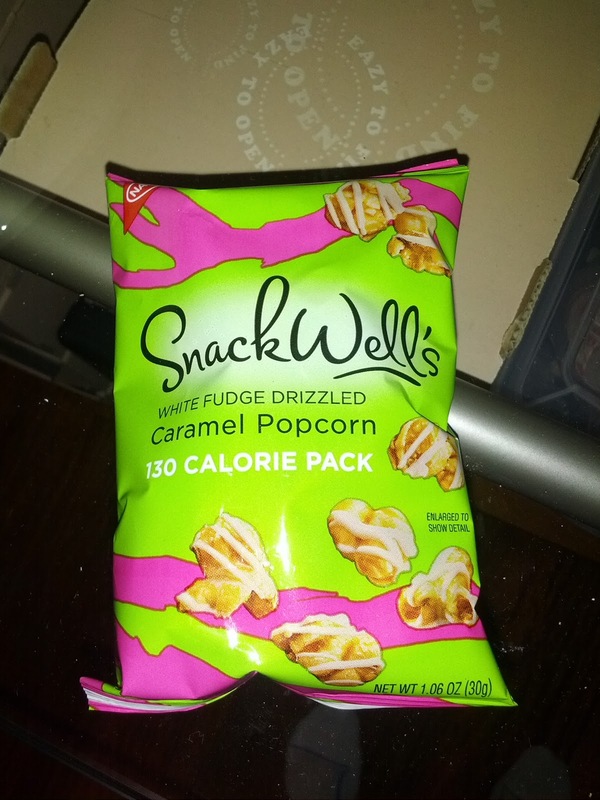 This allowed you to taste the caramel corn more, but I didn't like it as much. Still a very tasty snack though. These were just ok. 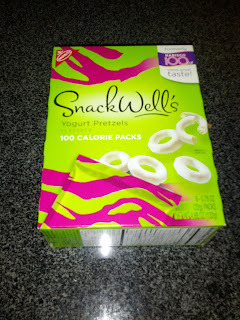 Fairly standard pretzels with a sorta sweet yogurt coating. The coating was generous and I liked the sweet and salty combo, but they weren't as good as other brands I've tried. 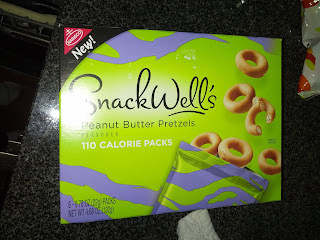 The reviews I read of SnackWell's pretzels all said the yogurt ones were better, but I love peanut butter, so I gave these a shot anyway, even though I didn't really like the yogurt ones. I agreed with everyone else, the yogurt ones were indeed better. These had some peanut butter flavor, but not very much, it was waxy, and kinda sweet. You just can't make peanut butter coating low calorie and low-fat, and I think that is what SnackWell's was trying to do. Definitely would not get again, and neither Ojan nor I wanted to finish all 6 bags that came in package. Soup Freaks is yet another local business I've discovered on LevelUp. Like many places, they give a small $2 initial credit, which can't purchase any of the main items, but covers desserts, like cookies, which I've been trying from all over town lately. The menu lists several types of cookies, but they seemed to never have any. I think I stopped in at least 5 times when they were out. 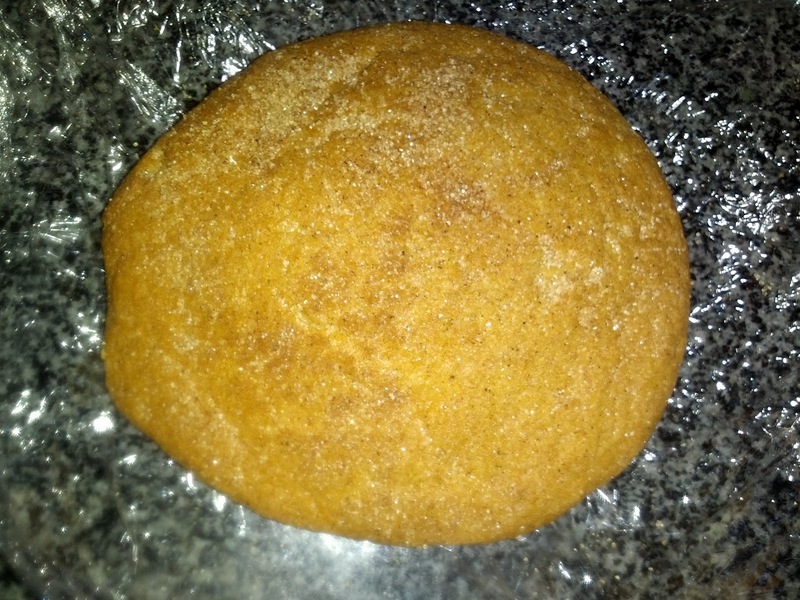 Finally, one time they had cookies, but only one type: snickerdoodles. Not what I'd normally pick. The cookies were all individually wrapped in saran wrap. They didn't look particularly good, but looks can be deceiving, as I learned from the delicious cookies from Quiznos, and they were free after all. The menu said the cookies were $1.50, but the sign located in front of them said $1.65. I was charged $1.65 + tax. They should update their menu! (This was on both the physical menu in the store, and online). 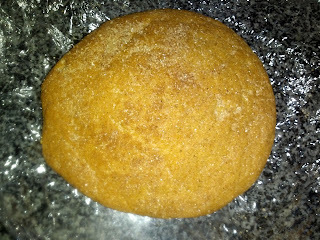 Anyway, after the snickerdoodle, I still went back a few more times to try other types, but again, they were always out. I finally asked when they expected to have cookies, and the staff member told me that they make a big batch early in the week, and just sell them until the run out. I was always going in on Saturdays and Sundays, and they'd long since run out. This also explains why they tasted stale and not fresh ... they weren't! After that, I did try visiting earlier in the week, but still no cookies. A few times, I saw little cheesecake bites. But they had flies swarming around them and sitting on them, and they were not covered in any way. Foolishly, I eventually tried them too. Meh. Won't be going back. This was a soft, cakey cookie. It didn't really have any flavor and there was absolutely nothing interesting about it. Dusted with cinnamon and sugar on top. Would not get again. This was not good. I should have known better. I didn't get one on my first several visits when I saw the flies swarming around them, but I was so sick of being disappointed by the lack of cookies that I finally tried one. I didn't have high hopes, but I think I still haven't gotten it through my head that cheesecake can be horrible. 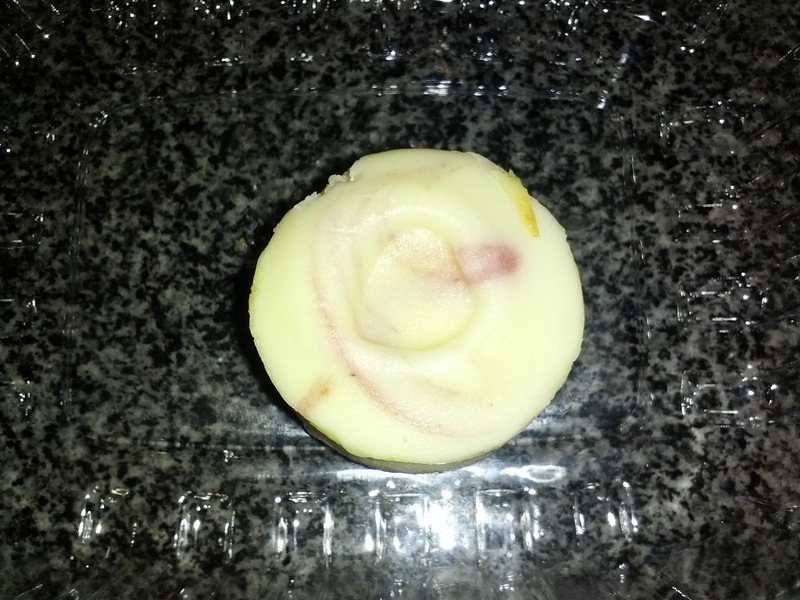 Even after the bad one from Jack In The Box, I still think, "hey, it is cheesecake, how bad can it be?" Answer? This was far worse than the Jack In The Box one. That one at least had a nice consistency. There was a little graham cracker crumble base, unremarkable. Then, the cheesecake. It had the worst mouthfeel of perhaps anything I've ever tried. I can't even describe it. It was like ... smooth paste? Not good. And it didn't taste anything like cream cheese or cheesecake. On top was a little bit of raspberry swirl, which did indeed taste like raspberry. It was the only redeeming factor. I passed this off to Ojan, without warning him that it was horrible. He thought it was so bad that he spit it out. Would never, ever get again. 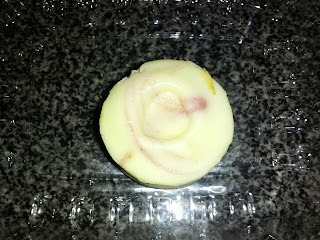 $0.95 seemed like a good price for a little cheesecake bite, but ugh. No. The Blue Plate is one of very few full service restaurants using LevelUp (doh, correction, they used to be on LevelUp, but it looks like they are no longer listed. They didn't seem all that familiar with it when I was there, so I'm guessing it just wasn't a big hit). Anyway, Blue Plate is a casual, neighborhood, "New American" restaurant located in Bernal Heights. I didn't take much notice of the interior of the restaurant, because it was a rare, ridiculously warm day in San Francisco, and I was seated out in their spectacular outside garden. If I recall correctly, inside was a bar area, and some regular tables. Nice enough, but nothing compared to the amazing outdoor garden! 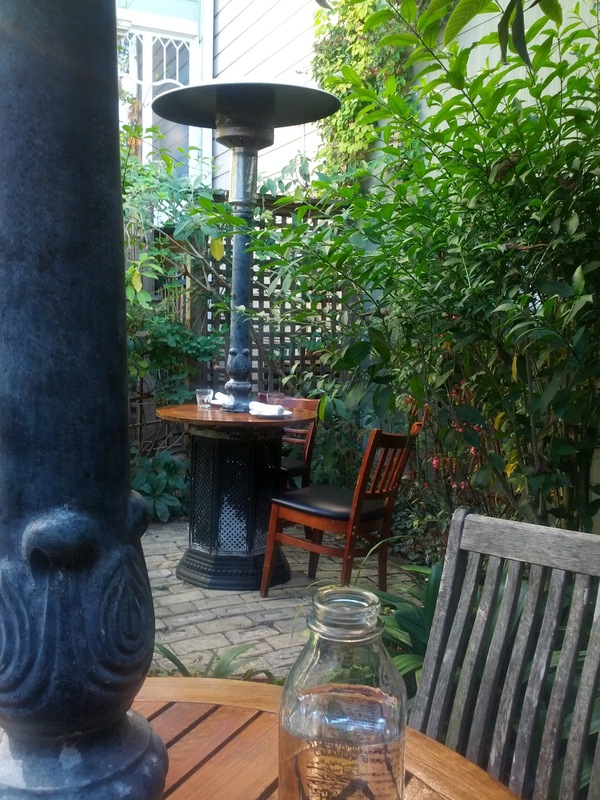 They have a beautiful backyard garden, with only 4 tables. The tables have heat lamps built-in them, but apparently they are no longer allowed to run them, so most of the time, they do not seat people outside. 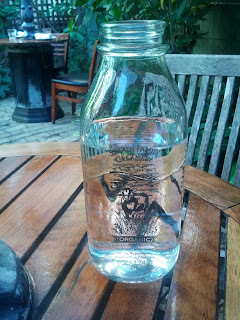 But I lucked out and was there during the indian summer, and it was ridiculously warm. The garden was full of trees and other plants, and since I was there early, no one else. I had this beautiful outdoor space all to myself! To start, they offer house filtered still or sparkling water, served in Strass Dairy jugs ... and at no extra charge. I love when places do this! 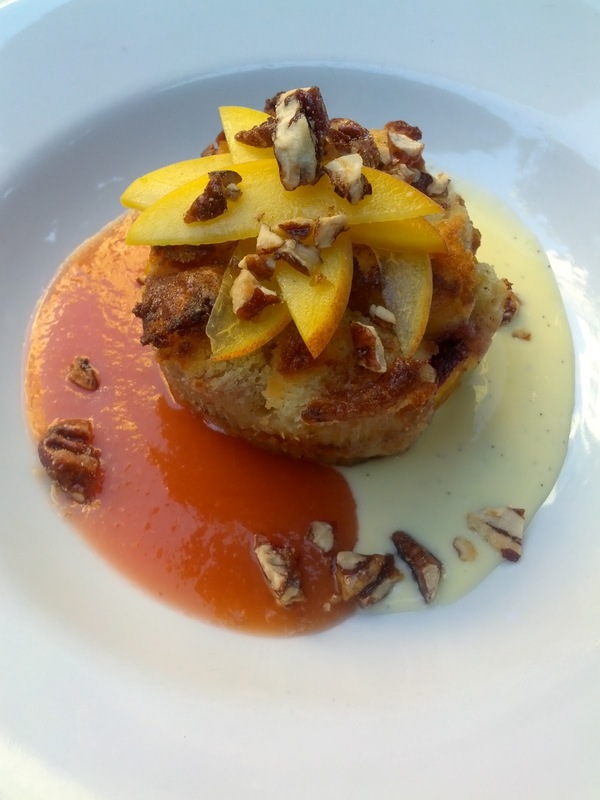 Peach and Blueberry Bread Pudding / Candied Pecans / Crème Anglaise. $8. The presentation was far fancier than I was expecting for a place with such a neighborhood feel, with a peach puree on one half of the plate, and crème anglaise on the other. The peach puree was very sweet, but really helped enhance the flavor of the overall dish. The crème anglaise had flecks of black in it, which I'm guessing was vanilla bean, but it didn't really have any vanilla flavor. It was fairly disappointing, not really offering up any creaminess nor flavor. I think whipped cream would have paired better. The bread pudding itself was served lukewarm. I would have liked it hotter, as only the edges were warm, and the center was still cold. The top was nice and crispy, but the interior was kinda just there. It wasn't dry, but it also didn't have the moistness I like in a good bread pudding. It also seemed to be solid, rather than made up of chunks of bread, although the top did seem like bread cubes, so I'm not really sure what was going on there. It had a few blueberries and nectarine sliced baked into it, but not many. They were moist and flavorful, but the rest of the pudding didn't have a lot of flavor. It had some cinnamon spicing to it as well. On top were a few candied pecans and thin slices of peach. The peaches were actually the best part of the dessert, perfectly ripe, really flavorful. Overall, this was just mediocre. I can't really pinpoint what was off about it, I think the consistency and temperature of the pudding were the biggest issues. It wasn't bad, but it wasn't great. It was leagues better than the horrible bread pudding I had at Soma Inn Cafe though! The size of the dessert was perfect. If I'd just had dinner, I could have easily split it with someone and been satisfied. As I was alone and just wanting a "snack", it was slightly bigger than I wanted, but just barely. I really appreciated that it wasn't too dainty nor jumbo sized. And $8 for a dessert of this calibre was totally justified. I wouldn't get this again, but I'd like to try more of these desserts. I recently joined the "Try-It" program for a local grocery store, Raley's. It sends you coupons (or loads them onto your account) to try out new products. Since I love trying out new things, and I love freebies, this has been a lot of fun. 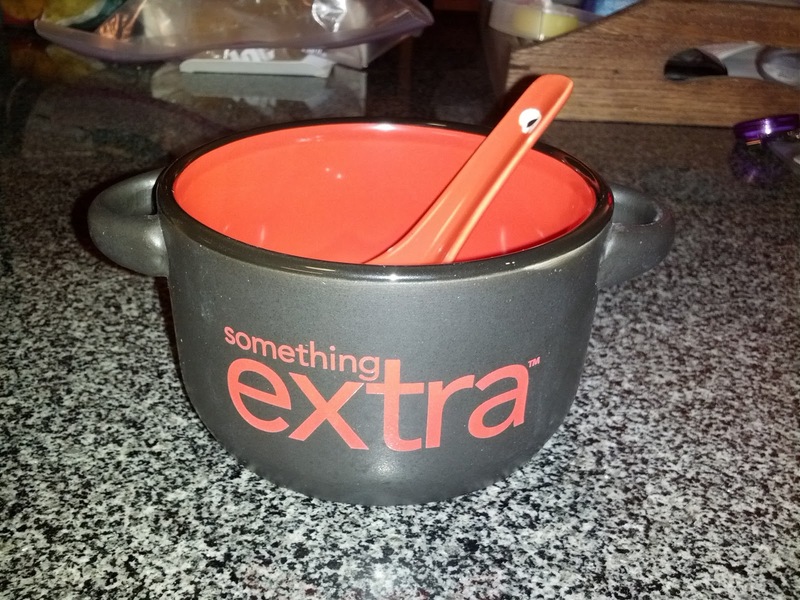 Soup bowl and soup spoon. My first "Try-It" box arrived with more than just coupons, it also included a cute little soup bowl and matching spoon! And a booklet of BOGOs. If anyone wants some, I have a bunch! 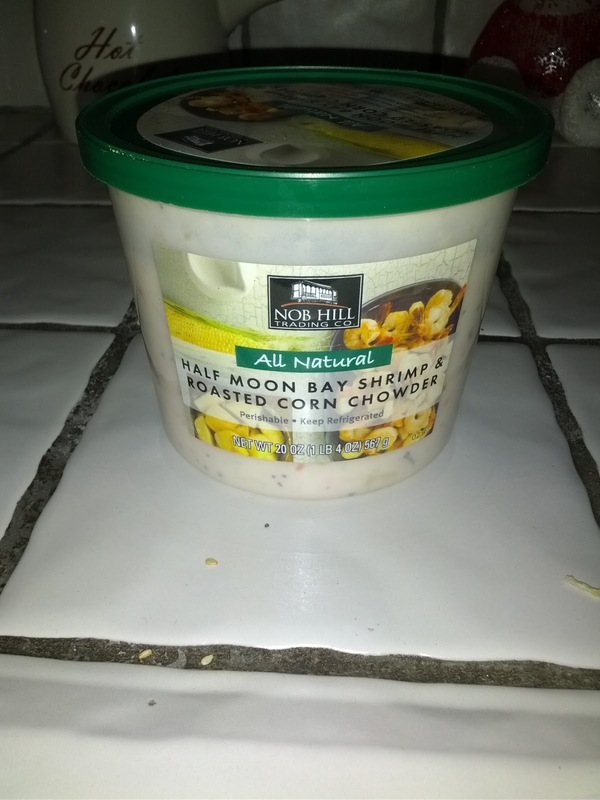 Nob Hill Trading Co. Half Moon Bay Shrimp & Roasted Corn Chowder. 20oz. $4.99. The program also loaded a free soup into my account! I could pick from any of their All Natural soups, in the 20 oz size. I had a hard time deciding which to pick. In addition to classics like vegetable soups, there was a temping sounding Indian curry, and a slew of seafood options, even a triple Crème Lobster Bisque! I decided on the Half Moon Bay Shrimp and Roasted Corn Chowder, mostly because I really wanted a seafood soup, and this one used more local seafood. The soups are all in the refrigerated section of the deli area, although they do not seem to be prepared fresh in the stores. They are sealed with plastic in addition to the lid, and had surprisingly long sell-by dates; the one I picked was good for a month, which scared me slightly. The soup was fully cooked and only needed to be microwaved or warmed on the stovetop. I went for the stovetop, but also had a few spoonfuls of it cold, and it was good that way too. The soup contained small bay shrimp, chunks of potato, kernels of roasted corn, all in a creamy chowder base. The shrimp were a bit rubbery, but not fishy, and far better than I expected in a prepared soup. The chunks of potato were well cooked, not mushy, not crunchy. I really liked the roasted corn, and would have preferred to have even more. The base was thick, creamy, and well seasoned. Overall, I was quite happy with the soup, and it tasted restaurant quality, certainly not packaged soup quality. The container was large, and easily contained enough for 2 large bowls. The regular $4.99 price seemed good, although all the soups were that price, and shrimp or lobster seems far more expensive than say vegetable or lentil soup. I'd get this soup again, perfect for a cold night!